Ocean exploration was a key scientific objective in the late 1800s. Any numbe rof oceanographic, biological, chemical, geological and physical discoveries had been made and one of the preeminent scientists was John Murray. The results of his voyages on H.M.S. Challenger led to this map, the first to make its focus the deeps, what occurs underneath the surface rather than previous voyages and explorations that were concerned with coastal and shallow waters. Murray recognised that measurement at depth required correct and operational instrumentation because it was indirect measurement that was required. Why was this necessary? Accurate survey of the ocean floor was paramount to the correct siting of telecommunications cables across the ocean basins. For that you needed an accurate map. 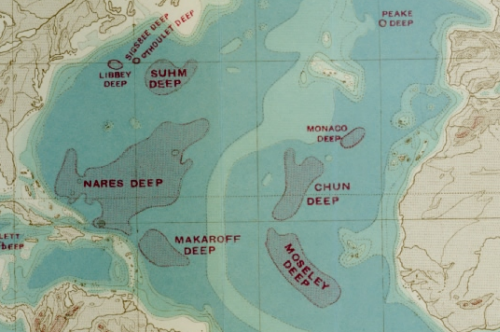 This map for the first time showed ‘the deeps’ according to Murray. The mid-atlantic ridge is clearly shown as are areas of the Atlantic Ocean that are greater than 3,000 fathoms deep. 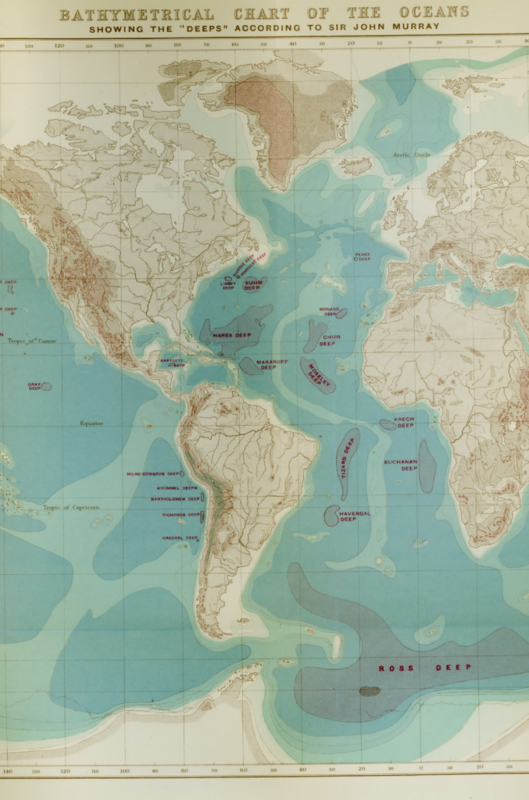 In many ways, Murray, the Challenger expeditions and this map were critical in the establishment of oceanography as a distinct branch of science. Murray went beyond calculating bathymetry though, he estimated temperature of the ocean floor as distinct to the surface as well as the amount of light penetrating the darkness and the impact on flora and fauna and marine deposits. The map uses subtle bathymetric tinting and is the first to officially name many of the deep ocean floor troughs. It’s not a complex map but it’s apparent simplicity belies the efforts and science that went into making it. Maps do not need to appear complex. They can be used effectively to communicate scientific discovery, accuracy and new knowledge. This map, for its time, was revolutionary and was the first to give us a sense of what lies beneath the surface of the vast expanse of seas and oceans. Murray’s ground-breaking essay on The State of Ocean Science can be read here. 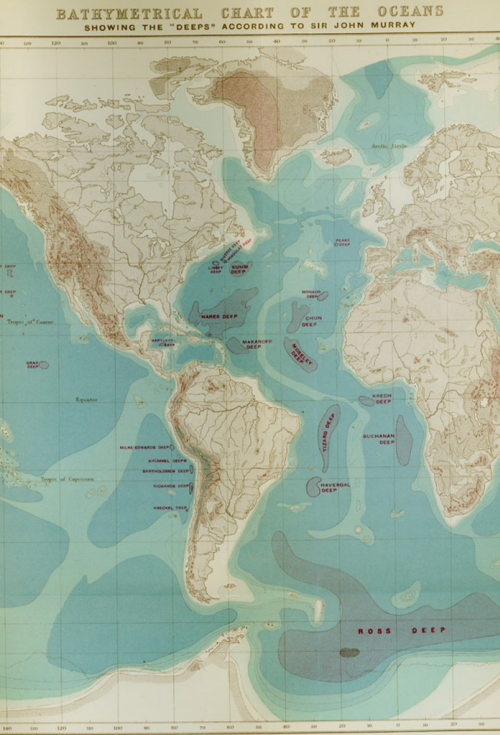 This entry was posted in MapCarte and tagged bathymetry, historical, MapCarte, oceans by @kennethfield. Bookmark the permalink.